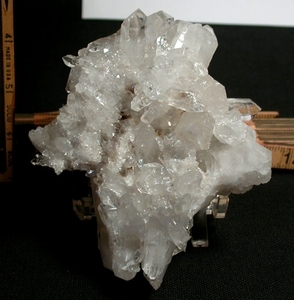 Shiny and bright, this Arkansas rock crystal burr cluster has multi-directional everything radiating from a peek-through center. An array of dazzling drusy to clear twins and triplets, to heavily veiled sturdy 3" points will delight. Crystallized on each side, extraction error has led to a most attractive price - nearly as bright as the doubly-terminated crystals to 3/4" and the myriad of rainbows. Large cabinet sized, 2-1/4x 4-1/4x 5" it's a clear choice for your collection.